This was an all right bathroom reader. The three books encompassed were all simple, easy to understand, and written with a good sense of humor. 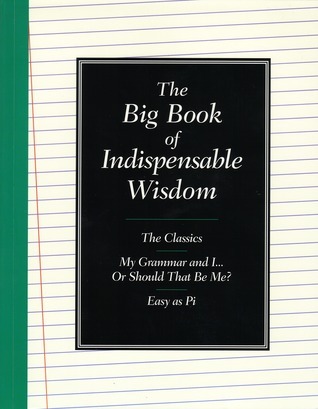 I'd say this is a good book for an English major to keep around, as it covers classical history, makes grammar a bit easier to comprehend, and even the math section has a god amount of good conversational tidbits. My main issue was that the half-assed job the editor did. Though the pages were numbered continuously throughout the three books (rather than starting over with each one), the in-text references were extremely inconsistent, sometimes pertaining to correct page numbers, sometimes indicating the page that the reference would have been on if the book were sold on its own - that is, "See page 63" really might mean "See page 324. "On top of that, there were at least two instances were a footnote got copied over and replaced the next footnote's text, which made reading a bit confusing at times. All in all: good toilet literature, but the editor should be ashamed.